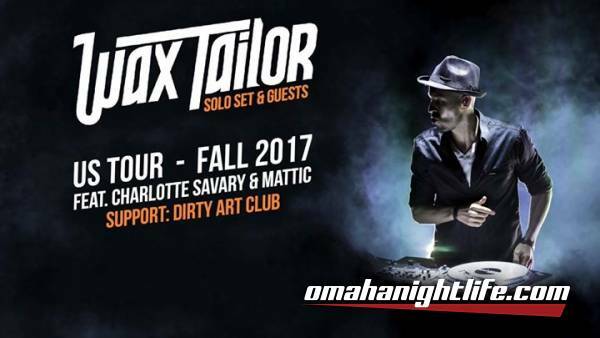 After a successful tour of 25 shows across the US this year, Wax Tailor is back for a new US Tour in November. For those additional 20 shows, mixing music & visuals, he will be joined on stage by Charlotte Savary (singer), Mattic (MC) & he's also bringing Dirty Art Club as the opening act. The french producer is releasing >, a relecture of his last album where he invites a dozen of producers. This album will be a world premiere as it will be released in a new format called "Vinyl connected >>. A defining figure of the european electronic scene, Wax Tailor's unique sound lays somewhere between cinematic electro and orchestral hip-hop. Digging through the crates of the forgotten melodies, the DJ / producer crafts musical fantasies where silver era Hollywood and 20th century music come together. He has gained recognition through the years with five studio albums, two double live albums and about seven hundred concerts in over fifty countries. With his last studio album, "By Any Beats Necessary" (featuring Tricky, Ghostface Killah, Lee Fields, R.A The Rugged Man, Token), Wax Tailor initiates a new take on the western frontier, leading us on a fabled road where Blues, Psychedelic Rock, Soul, Funk and Hip-Hop collide. Wax Tailor has collaborated with numerous artists (Ghostface Killah, Tricky, Sharon Jones, Lee Fields, Ursula Rucker, Keziah Jones, Aloe Blacc, Charlie Winston, Alice Russell, Archive, RJD2, DJ Format, DJ Vadim, General Elektriks, Daedelus).